Preheat the oven to 375 Fahrenheit. Pierce each beet several times with a fork. Coat the beets in olive and season with salt and pepper and wrap each one separately in foil. Bake them for 30 minutes Allow the beet to cool and then peel, and slice into thin half-moons. Meanwhile, in a medium sized pot, combine the vinegar, sugar, and 1 cup water and bring the mixture to a boil. 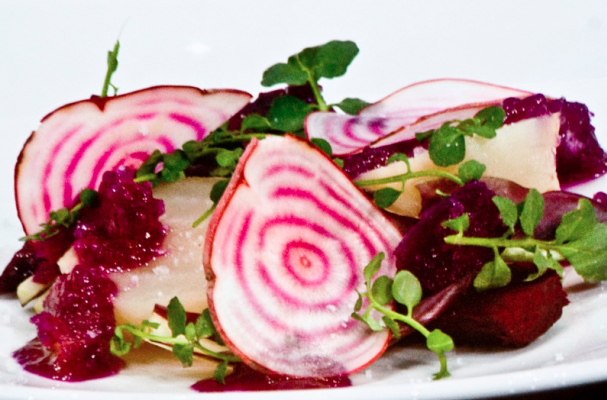 Divide the pickling liquid into three separate bowls and place each colored beet in their own bowl. This prevents the red beets from staining the other two lighter colored ones. Let the beets pickle for 3 hours. In a medium bowl, whisk together the honey and olive oil until well combined. Then add the lemon juice, white balsamic vinegar and thyme. Season with salt and pepper. Adjust as necessary. Toss the arugula and spinach in the lemon vinaigrette. Arrange the pickled beets and sprinkle with the pistachios and pomegranate seeds. Serve immediately.